The growth of the field of group dynamics was synonymous with the rise of the T-group in leadership education. This article documents the tumultuous history of the T-group movement in the United States, particularly as it has been applied in management development. Although the T-group is commonly dismissed as a management fad, the author suggests that it represented an important phenomenon in the hisiory of applied behavioral science and was the first serious attempi at large-scale management and leadership developmenti. The notion of providing managers with feedback on how their behavior impacts others is as popular today as it was 50 years ago. What has changed is the mechanisms by which such feedback is provided. Although training programs in human relations far supervisors had been introduced during thè 1920s and 1930s, they rarely extended beyond the first line of management. Indeed, prior fo World War II, the grooming of future executives involved little more than job rotation and mentoring (Dooher & Marquis, 1952). Following Worid War II, however, management development took the business world by storm in the form of the T-group, or sensitivity training. Although some people distinguish between the T-group, which is primarily associated with National Training Laboratories, and sensitivity training, which is often associated with Western Training Laboratories (see L. K. Lee, 2001), the two approaches were almost indistinguishable in practice. Therefore, I use the term T-group to encapsulate all management-related sensitivity or encounter groups. T-groups involved small unstructured groups of managers engaging, typically off-site for as many as 3 to 4 weeks, in honest and open communication in what was commonly referred to as the "here and now." These groups were devoid of any content or subject matter, except for the immediate experience of the group members. Thus, the focus of the T-group became the behavior of the group members struggling to deal with the lack of structure. This struggle was exacerbated by a passive facilitator. The primary mechanism for learning was the feed-back received by each individual from group members. Resistance to self-examination was broken down, and an atmosphere of openness to change often emerged. What may sound today like a silly exercise in organizationally sponsored summer camping was actually a profound emotional, and sometimes life-altering, experience for many of the participants. T-groups have been derided as cultlike, faddish, and even unethical and damaging (e.g., Back, 1972; Drotning, 1966; Kane, Wallace, & Lipton, 1971; J. A. Lee, 1980; Odiorne, 1963), but there is little question that the T-group movement represented an important phenomenon in the history of behavioral science applied to me workplace. At their height of popularity in the 1960s, T-groups were experienced by thousands of executives from organizations such as TRW, Westinghouse, Eastman Kodak, IBM, General Electric, Eli Lilly, Monsanto, Pillsbury, Boeing, Maytag, and many more. Experiences of T-group participants were widely recounted in popular magazines, business journals, and books (e.g-. Back, 1972; Chase, 1951; Coghill, 1968; GIueck, 1968; Klaw, 1961; Marrow, 1964; Poppy, 1968), and an astounding number of T-group leaders were pioneers in the field of organizational behavior. Despite its important influence on the entry of behavioral science into the executive suite, however, it seems that the contemporary generation of social psychologists and management scholars knows little if anything about the T-group movement. In this article, I trace the history of the T-group from the early democratic ideals of its founders to the later establishment of the technique as a necessary milestone in executive self-discovery. I argue that T-groups were more than soft, mushy, touchy-feely encounter groups but were often serious interventions aimed at instilling authenticity and confrontation in organizational life. I examine the reaction of the academic and business community to T-groups and speculate about the reasons for their dramatic decline in popularity. Finally, I discuss the legacy of the T-group movement and compare its assumptions and practices to modem executive-development techniques. The period immediately following World War II was an exhilarating time for the behavioral sciences. It was marked by a profound scientific curiosity for derstanding conflict and the impact of the group on the individual, along with an unabashed social consciousnessaimed at curing society's problems through action-oriented research. A leader in this movement was Kurt Lewin. Lewin was a strong believer in the need to leach democratic values and his experiences with J. R. P. French at Harwood Manufacturing Corporation in the late 1930s taught him that learning was best accomplished when the student experienced how his or her behavior impacted others. Thus, techniques such as role-playing and feedback were seen as effective in bringing out criticism in a healthy and constructive way. Lewin was recruited by Douglas McGregor to establish the Research Center for Group Dynamics at the Massachusetts Institute of Technology (MIT) in 1944 (Invented Here: A Brief History, 2002). Lewin's center was contacted in 1946 by the executive director of the Connecticut Interracial Commission to help train leaders to deal with intergroup tensions in their communities. The goal of the Connecticut Interracial Commission was to facilitate learning and compliance with the Fair Employment Practices Act, under which the commission had been created. Lewin, who saw an opportunity to put into practice his humanistic values for social good and also saw an opportunity to conduct field research on group behavior, quickly agreed to the assignment (Bradford, 1967). Ronald Lippitt agreed to direct the project, and Leiand Bradford and Kenneth Benne both agreed to join the training staff. The workshop was conducted in New Britain, Connecticut. The major goal of the workshop was to enable businesspersons, labor leaders, and school- teachers to better deal with intergroup tensions, but most of the actual participants in the workshop in 1946 came from teaching and social work professions. The idea was to find better methods of changing people's attitudes and provide them with greater insight into their own attitudes and values. Lewin believed that leadership training was effective only when it provided trainees with opportunities to see how their customary way of acting affects others (Marrow, 1967). The major method used by the trainers was group discussion and role-play. A research observer recorded the group interactions, and Lewin arranged for evening meetings of the research observers to pool and record on tape their process observations. Eventually all students attended the sessions, which often continued well into the night. Thestudents reported that they were gaining important insights into their own behaviour and thebehaviour of their groups. Moreover, the training staff realised that it had "somewhat inadvertently" hit upon a powerful method of reeducation (Benne, 1964). Energized by the experience in New Britain, the trainers decided to repeat the workshop the following year. Although the Connecticut Interracial Commission did not continue its interestin the project, Lewin, Lippitt, Bradford, and Benne forged ahead with plans to develop a workshop for teaching people to be more efficient in their work within groups. Delegates could be selected to represent government, industry, and civic organizations. Rather than focusing on intergroup relations, the focus was to be on the group itself. That is, the discussion of the day's events, which the Connecticut participants renamed "feedback," was to be the central focus of this new workshop (Back, 1972).The workshop was to take place at the Gould Academy, in Bethel, Maine. The trainers choseBemel because it was close enough to MIT to keep travel costs down but far enough away tocreate a "cultural island" effect (Bradford, 1967). Lewin secured support from the Office of Naval Research, and Bradford secured financial backing from the National Education Association (NEA). Thus was born the National Training Laboratory (later shortened to NTL) for Group Development. Moreno explicitly identified Lippitt, French, Bradford, Benne, Paul Shears, and others as "the bright boys silting in my classes" who later engaged in "astute and Machiavellian practices" (p. 102). However, the mild-mannered Bradford acknowledged meeting and observing Morenoand adopting his psychodrama methods for training, not knowing that Lippeit, French, Alvin Zander, and others had preceded him (Bradford, 1967). In addition to Moreno's influence, Sherif (1936) introduced the concept of social norm and showed that such norms can be created experimentally. By placing people in a situation that had no clear structure, he showed that individual experiences tended to converge with the normative ranges of experience established by the group. In addition, field research by Newcomb in the 1930s (Newcomb, 1943) showed how the community rewarded students for adopting the approved attitudes of the group. Both of these studies influenced Lewin's concept of the individual-change process in groupsinvolving unfreezing the current situation, changing attitudes, and refreezing the new behavior. This unfreeze-change-re freeze framework has been a guiding force in the evolution of me T-group, as well as subsequent theorizing on the change process in organizations (e.g.. Beer, 1976; Schein & Bennis, 1965). More immediate influences on the ideas of the T-group developers were the projects conducted during World War II by the Tavistock Institute in England and the Office of Strategic Services (OSS) in the United States. The Tavistock Clinic was formed after World War I as an outpatient clinic for dealing with war-related neuroses. Members of the Tavistock Group,most notably Eric Trist and W. R. Bion, were widely known for their experimentation with group therapy techniques. Bion (1946) theorized about aggression and withdrawal that occurs in groups and developed the leaderless group techniques used for crew selection. In fact, the term "here and now" was commonly used by the Tavistock staff in the early 1940s(Back, 1972). Trist and Lewin had direct contact in 1945, and prior to his death, Lewin had made plans to spend the year at Tavistock in 1948. Lewin and Lippitt's involvement in OSS spy selection was probably also an influence on the development of T-group methods. Under the primary direction of Henry Murray, Lewin. Lippitt, and others devised methods to identify men and women to serve as agents to conduct destructive operations behind enemy lines, train resistance groups, and "disintegrate" the morale of enemy troops (Office of Strategic Services Assessment Staff, 1948). OSS candidates were taken to a secluded farm house, stripped of their personal belongings, dressed in army fatigues,and instructed to create false identities over a period of 3 days. The candidates participated in assessment activities together, spent leisure time together, and revealed much about their personalities as a result of being isolated as a group. The observed effects of this seclusion likely influenced the decision to create a cultural island for the conduct of T-groups. One problem was that the training objectives of the early workshops were overly ambitious. The trainers set out to teach diagnostic and action skills of the change agent,' to provide an understanding of behaviour in small groups, and to enhance understanding of democratic values. All of this was to be done in addition to helping people internalize more effective processes of solving human problems by examining and an alyzing ongoing interactions in the groups. According to Benne (1964), mere was an early tension between discussing here-and-now happenings and discussing outside case materials. This tension was typically resolved by rejecting the outside problems as "less involving and fascinating" (Benne, 1964, p. 86). The focus of the BST groups was now almost entirely on sharing impressions and gaining greater understanding of oneself and others. Figure I shows Leiand Bradford leading an early BST group at Gould Academy. Because the trainers began to see the interrelatedness of social and clinical approaches to group dynamics, a deliberate effort was made to invite more clinically oriented trainers to NTL in 1949 (Bradford, 1967). Almost immediately, conflict arose between the new trainers, holding either Freudian or Rogerian viewpoints, and the Lewinian old-timers. The old-timers were out numbered, and Bradford, Benne, and Lippitt were deposed in 1949 from direct leadership of the BST group (now rechristened the T-group). According to Benne (1964), the language of interpretation of events became more psychoanalytic or Rogerian and less sociological or Lewinian. This should not be interpreted to mean that Bradford, Benne, and Lippitt had dropped out of the picture. Indeed, Bradford was executive director of NTL until 1970. The old-timers simply took a less active role in the guidance of T-groups and were actually supportive of the leaner, more clinically focused approach to T-grouping. They were concerned, however, that the training sessions might turn into therapy sessions. This, they felt, would violate the contract between the staff and the participants, who came to the lab for an educational experience in human relations, rather than psychotherapy. Despite these misgivings, an attempt was made to have participants go through T (training) groups in the mornings and A (action) groups in the afternoons. The A-groups were led by prominent educators, sociologists, and social psychologists who were generally unfamiliar with NTL and its methods (Bradford,1974). Whereas the T-groups were clinically oriented, the A-groups were focused more on larger social systems. The problem was that the A-groups usually turned into T-groups (Benne, 1964). In 1956, the first homogeneous groups for executives were conducted. Throughout NTL's short history, T-group participants had been teachers, social workers, priests, and, only occasionally, managers. Most of the trainers feared that occupational homogeneity would cause people to "talk shop" rather than engage in here-and-now interactions (Bradford, 1974). However, the T-group method naturally lent itself to corporate leadership training, and NTL was in need of some financial support. A grant from the Carnegie Institute had run out by 1954, and money from the NBA barely covered Leland Bradford's salary and that of one or two others. The decision to move into executive training was helped along by an article in Business Week, extolling the virtues of T-group training ("What makes a small group tick? ", 1955), along with Douglas McGregor's recruitment efforts at MIT's Sloan School of Management. McGregor, known for his Theory X and Theory Y approaches to management, was one of the early practitioners of T-groups in industry and a long time, advisor to NTL. He was also on the board of Standard Oil of New Jersey (now Exxon), which sent a number of executives to NTL during the early 1950s. Rensis Likert, of Michigan's Institute for Social Research, was also involved in the design of the new "key executive" labs (Bradford, 1974). To accommodate the new influx of executives to NTL, many of the sessions were held in the more geographically convenient Arden House in the Hudson Valley, and the sessions were cut down from 3 weeks to 2 weeks in duration. McGregor (1960) used the term "gut learning" to describe the kind of learning that took place in NTL labs. Such vague terminology is characteristic of attempts to describe the T- group experience- For example, it was not uncommon for T-group participants to return from the cultural island unable to express what they had experienced. According to Marrow (1964), the returning executive "usually ponders a moment, tries to formulate a description that will convey the essence of the experience in terms his questioner will really understandand then finds there is no easy way to do it" (p. 28). Fortunately, a number of firsthand accounts of T-groups were recorded that allow a peek inside this mysterious process (e.g., Coghill, 1968; Glueck, 1968; Klaw, 1961; Poppy, 1968). Although much was often made about the variations in T-group methods from trainer to trainer, more striking is the commonality that is evident across the various published descriptions. Kleiner (1996) noted that T-groups were clearly the most effective unfreezing device known but diat "the NTL people didn't quite understand how to refreeze" (p, 38). The transfer-of-training issue would continue to be a thorn in the side of T-group advocates in the years to come. The 1960s were heady limes for NTL and its trainers. T-groups were being championed by such luminaries as Abraham Maslow and Carl Rogers, and executives were beating down the doors of NTL to become "Bethelized." More than 20,000 business men and women thronged to the workshops by 1966 (Friendly. 1966). T-groups were not without their critics, however, as William Whyte's (1956) widely read book The Organization Man opened with an attack on NTL practices for discouraging initiative and leadership in groups. Unfreezing, it seemed, was seen as a method of breaking down an individual's resistance and creating the conditions for brainwashing (Kleiner, 1996). The irony was not lost on the T-group trainers, who believed that they were providing an antidote to individual manipulation by breaking down social taboos and creating an environment of open inquiry. Bradford (1974) noted experiencing considerable hostility, as early as the mid-1950s, from academics in social work, psychiatry, and much of psychology. The response from NTL's executive committee was to strengthen its connection with universities and research to "develop and maintain scholarly respectability" (Executive Committee, National Training Laboratories, 1959). The argument that drew the most attention, however, centered around the damaging effects of T-groups on their participants. Odiorne suggested that T-groups created stressful situations that frequently spun out of control He noted how in one of the T-Groups he attended, a woman "went berserk" and required psychiatric treatment until she" returned home. Trainers were accused of playing God and tinkering with a powerful psychological instrument that they were often not equipped to control. Although Argyris responded by challenging many of the allegations as distortions of facts, it was clear that the damage had been done. Suspicions about the mischievous activities of T-group trainers would continue to raise doubts in the minds of the members of academic and business communities throughout the l960s and 1970s. As me size of NTL grew and the number of regional labs increased, trainers had less physical and emotional attachment to NTL and Bethel (Bradford, 1974). Demand for T-groups increased steadily in the late 1950s and early 1960s, and trainers could not ignore the lucrative opportunities to consult outside of the NTL umbrella. One of the earliest NTL defectors was Robert Blake, of me University of Texas at Austin. In 1958, Blake, along with Herb Sheperd and his Texas colleague Jane Srygley Mouton, were recruited by the Bayway Refinery of Esso (then Exxon's East Coast operation) to conduct T-groups on a massive scale. Blake, who is often credited with first using the term "organization development" (OD) in describing activities at the Bayway Refinery (Kleiner, 1996), and Mouton developed their own variation of T-groups called "instrumented groups." Instrumented groups relied heavily on responses to paper-and-pencil questionnaires to provoke discussion in T-groups. This process eventually evolved into their well-known Managerial Grid system (Blake & Mouton, 1967), which many NTL insiders derisively referred to as "T-group in a box" (Kleiner, 1996). By copyrighting the Managerial Grid system, Blake was the first to violate the unwritten sharing code at; NTL, and he demonstrated to NTL trainers that it was far more lucrative to take the T-group on the road. Another dramatic shift in philosophy, ushered in by Blake and those who followed, was the use of T-groups on managers working within the same company. Recall that NTL was even nervous about implementing "homogeneous" T-groups made up of executives from different companies. This new approach to T-group training, referred to as "family" T-groups, involved conducting sessions, either off-site or on-site, with coworkers. Whereas a manager might have been able to leave Bethel and his T-group partners behind when the experience ended, the family T-group members had to face one another at the water cooler after the sessions were over. According to Glen Varney, a former T-group participant and trainer, "the internal [T-groups] were the ones that were most destructive" (personal communication, July 27, 2001). Varney noted that Chrysler had T-groups running throughout the company in the early 1970s and later viewed it as the worst thing they had ever done. Participants reportedly quit, told their superiors off, or, in some cases, had psychological breaks. One suicide was thought to have resulted from the T-group intervention. At least one other suicide connected to T-groups occurred following a family T-group session at a testing laboratory at General Foods (J. A. Lee, 1980). Although standards for the conduct of T-groups within NTL were strict, the use of T-groups by consultants, who- might have merely attended a sensitivity group in the past, was mushrooming- What was increasingly being referred to as "therapy for normals" was being conducted by people with no training in the use of psychotherapy. Not all of the attention to T-groups was negative, however. A profile of TRW's experimentation with T-groups, published in Look magazine, heralded the use of the technique as signaling a "new era in industry" (Poppy, 1968). In the 1960s, the TRW Systems Group in California implemented a large-scale leadership development laboratory aimed at increasing interpersonal openness and decreasing defensiveness. The central tool in the leadership program was the T-group. Consultants to TRW included Robert Tannenbaum of the University of California, Los Angeles (UCLA), Herb Shepard of Case Western Reserve University, and "almost every top person in the country who was involved in OD as an external consultant" (Tannenbaum, 1996, p. 328). The TRW T-groups were vertically structured, meaning that participants represented each level of management in the organization. Although an attempt was made to avoid having someone participate in a T-group with his or her boss, this situation did occur on occasion Tannenbaum, 1996). Participants were instructed to be "absolutely honest" and to let others in the group share what they felt "from the gut" (Poppy, 1968, p. 66). TRW representatives detested (he "sweetness-and-light" impressions that were often associated with T-groups. They instead emphasized the importance of T-groups for instilling directness and candor into organizational problem solving (Davis, 1967). Although such confessions could have positive effects in individual psychotherapy, it is difficult to see a direct connection to managerial development or work-group performance. Indeed, in the context of these vertically integrated T-groups, the potential for career damage to the confessor seems unreasonably high. The cost-benefit trade off was a central theme in Campbell and Dunnette's (1968) review of the literature on T-groups published in Psychological Bulletin. 'The authors concluded that although T-groups have been shown to result in behavioral changes in participants, it is unclear whether these changes impacted job performance and, more important, whether such changes could not be achieved using less invasive training approaches. The authors gave particular attention to the question of transfer of training and noted that existential life enhancement should not be confused with the development of executives in their organizational roles. The latter, according to the uthors, requires rigorous scientific evidence to support its usefuiness. Although the Campbell and Dunnettearticle was a balanced critique of the evidence, it confirmed for skeptics that the T-group was nothing more than an overhyped management fad. Indeed, the article became among the 10 most-cited pieces in the history of industrial psychology (Sackett, 1994). By the end of the 1960s, the T-group movement had peaked. Articles began appearing in the training and business Journals questioning whether T-groups were worth the financial and psychological costs (e.g., Joure, Frye, Green, & Cassens, 1971; Mann, 1970; Wohlking, 1971).Psychologists began to question the ethics of conducting therapy in a business setting (Lahin, 1969; Peters, 1973), and psychiatrists condemned T-groups as an example of "psychological pollution" (Crawshaw, 1971; Kane, Wallace, & Lipton, 1971). In an article in Modern Management, William Gomberg of the Wharton School of Finance referred to T-group training as a "shambles and a disgrace." According to Goinberg, "I think they're playing with dynamite" ("Is sensitivity training a valuable tool or a risk? ", 1970, p. 15). Enrollments at NTL began to decline, and the organization reluctantly began promoting itself through direct mailings and advertisements. This was too little too late, however, as NTL lost $142,742 in 1970 alone (National Training Laboratories, 1970). It was clear that T-groups were becoming unfashionable. Surveys of personnel and training directors showed that sensitivity training was no longer seen as an important pan of management development by the mid 1970s (Kearney & Martin, 1974; Rettig & Amano, 1976). Figure 2 shows the number of references to the T-group in periodicals registered on the PsycINFO database. This figure shows that the dramatic rise in T-group popularity in the mid-1960s was followed by an equally dramatic decline in the mid-1970s. What was at one time considered the most potent social invention of the -20th century (Rogers, 1970) was suddenly a part of management folklore. NTL declared bankruptcy in 1975 and carried on as a shadow of its formal self in subsequent years. The failure of the T-group to persevere in its original form was partly due to the actions of NTL and partly due to factors outside of the organization's control. The research Jocus of NTL, which was quite heavy in the 1950s, gradually dwindled to nonexistence by the 1960s. Bradford (1974) attributed this to a lack of resources, the shortening of the sessions to 2 weeks, and "a, wave of anti-intellectualism" (p.73) that swept the staff at NTL. The idea of theorizing about and analyzing group processes became antithetic to the increasingly clinically oriented staff who were focused on living in the here and now. Even the early social psychologists who sat in as observers found it hard to resist becoming part of the group, and remarked that it was hard for them to leave the "churchlike" experience only to be presented with facts and figures in an evaluation session (Back, 1972, p. 53). Although NTL had founded the Journal of Applied Behavioral Science as an outlet or small-group research. 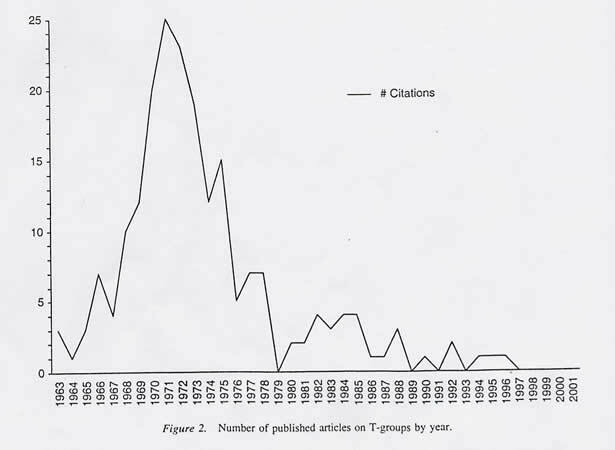 Goodstein and Dovico (1979) documented a slow and steady decline in the percentage of small group theory and research articles published in the journal' between 1964 and 1978- The increasing gap between T-group practice and small-group research cost NTL much of the academic respectability that it once enjoyerf and diluted the talent pool for trainers and advisers (Warner Burke, personal communication, July 23, 2001). Soon's we gathered 'round. I lost that me feeling. All insecurity broke when he appeared. There'll be no autocracy on anyone's part. Clearly the T-group could not overcome its association with every free-expression movement of the period. As Saranson noted, the goals of the original T'group pioneers were noble,and the procedures for increasing openness had their place. However, according to Saranson (1972), "their current faddishness will undoubedly result in their disrepute and obscure what merits they have" (p. 131). History has show that Saranson was correct. To dismiss the T-group phenomenon as an embarrassing fad would be to ignore the important influence it has had on modern executive and organization development. It is well known that the entire field of OD was founded and built by former T-group trainers (French, 1982: Kleiner, 1996). However, the T-group has had a more subtle influence on modem techniques considered to be mainstream management-development practices. For instance, the practice of team building evolved from "family" T-groups like those conducted at Esso's Bayway Refinery (Woodman & Sherwood, 1980). The early approaches to team building were nothing more than T-groups with a work-related focus. More modem versions of team building, often referred to as outdoor leadership training (e.g., Holden, 1994; Keller & Olson, 2000; Laabs, 1991), incorporate many of the leaderless-group tasks introduced by Bion for the War Office Selection Board during World War H, and nearly all of them use the cultural-island concept. It is also popular these days to use "360-degree" feedback techniques for providing developmental feedback to managers in organizations. These management-development programs involve managers completing a self-evaluation on a set of criteria and having evaluations completed by a superior, peers, and direct reports. The manager men receives a "gap analysis" detailing how his or her self-perception compares with how he or she is perceived by others. One-on-one coaching sessions are used to guide the development process. The basic notion behind 360-degree techniques, therefore, is that managers will develop insight into their own behavior and how it impact others (e.g., Diedrich, 1996; London, 1995). This is the very principle that guided the development of the T-group. Perhaps the nearest relative to the T-group existing on a large scale today is the diversity training movement. Edie Seashore, a shining star among the T-group trainers at Bethel in the 1950s, was hired by AT&T in 1973 to conduct training for women and minorities. This move followed a class-action suit by the Equal Employment Opportunity Committee, in which part of the agreement included the provision that women and minorities be taught skills needed to advance in management. Seashore quickly discovered that the individuals in need of training were the White men in management positions (Kleiner, 1996). This first experience with diversity training inspired Seashore to pick up the pieces of what was left of NTL and focus its efforts toward the use of T-groups for enhancing racial, ethnic, and gender sensitivity in organizations (Jones & Griffin, 1989). In 1991, the Public Broadcasting System aired the documentary The Color of Your Skin (Galan, 1991) showing the U.S. Military's extensive race-relations training program, considered the state- of-the-art at that time. At. the center of this program was a multiweek small-group laboratory that differed little from a T-group run in Bethel over 40 years earlier. For example, early Bethel terms like "fishbowl" are used to describe the setting for the primary group exercise, and the group discussion is characterized by a lack of structure and a passive facilitator who occasionally intervenes to put someone on the "hotseat." Poppy (1968) noted the irony in the fact that a national movement toward free emotionality and expression was led "not by flower children but by no-nonsense businessmen" (p, 73). Although the love-trust model of group interaction may not have revolutionized business in the way that early T-group pioneers envisioned, it has inspired countless organizational change efforts and management development programs. Whether we will ever return to this humanistic approach to executive self-actualization is anyone's guess. What programs such as team building, 360-degree feedback, and diversity training show is that we are not as far away from it as some would have us believe. Argyris, C. (1963, October). A brief description of laboratory education. Training Directors Journal. 17. 4-8. Back. K. W. (1972). Beyond words: The story of sensitivity training and the encounter movement. New York: Russell Sage Foundation. Beer, M. (1976). The technology of organization development. In M. D. Dunnette (Ed. ), Handbook of industrial psychology (pp. 937-993). Chicago: Rand McNally. Benne, K. D. (1964). History of the T group in the laboratory setting. In L. P. Bradford. I. R. Gibb, &. K- D. Benne (Eds. ), T-group theory and laboratory method (pp. 80-135). New York: Wiley. Bion, W. R. (1946). The leaderiess group project. Bulletin of the Mennmger Clime. 10, 77-81. Bradford, L. P. (1967); Biography of an institution. Journal of Applied Behavioral Science. 3. 127-143. Bradford, L. P, (1974). National Training Laboratories: Its history, 1947-1970. Bethel, ME: NTL Institute for Applied Behavioral Science. Campbell, S. P., & Dunnette, M. D. (1968). Effectiveness training and development- pychological Bulletin, 70, 73-104. Coghill, M. A. (1968, May-June). What happens in a 'T" group? Personnel Administrator. 13, 41-44. Crawshaw, R. (1971). Community mental health and Clinic. 35, 407-415. Davis. S- A. (1967). An organic problem-solving method of organizational change. Journal of Applied Behavioral Science, 3, 3-21. Diedrich, R. C. (1996). An interactive approach to executive coaching. Consulting Psychology Journal: Practice and Research, 48, 61-66. Drotning. J. E. (1966). Sensitivity training: Some critical questions. Personnel Journal. 45. 604- 606. Dunnette. M. D. (1969). People feeling: Joy, more joy, and the "slough of despond." Journal of Applied Behavioral Science, 5, 25-44. Executive Committee, National Training Laboratories. (1959, October 19). Minutes of the executive chives of the History of American Psychology. Akron. OH: University of Akron. French. W. L- (1982). The emergence and early history of organization development: With reference 261-278. Friendly, A. (1966, November 27). Where bosses let their hair down. The Washington Post. Galan, H. (Producer). (1991, June 11). The color of your skin [Television series episode]. In D. Fanning (Producer), Frontline. Boston and Alexandria. VA; WGBH/Public Broadcasting System. Glueck. W, F. (1968). Reflections on a T-group experience. Personnel Journal, 47, 500-504. Howard, J, (1968. July 12). Inhibitions thrown to the gentle winds- Life, 64', 48. 56. Is sensitivity training a valuable loo! or a risk? (1970, April). Modem Management. Jones, J. E., & Griffin. J. T- (1989). The use of group relations methods in the African-American community. In W, Sikes, A. Drexler, & J. Gant (Eds. ), The emerging practice of organization development. Alexandria. VA: NTL Institute for Applied Behavioral Science. Joure. S- A.. Frye, R. L., Green, P. C.. & Cassens, F. P. (1971, December). Examples of the over-use of sensitivity training. Training and Development Journal, 25, 24-26. Kane. F. J., Wallace, C, D.. & Lipton, M. A. (1971). Emotional disturbances related to T-group experience. American Journal of Psychiatry, 127, 954- 957. Kapian, R. E. (1986). Is openness passé? Human Relations. 39, 229-243. Keamey. W. J.. & Martin, D. D. (1974). Sensitivity training: An established management development tool? Academy of Management Journal, 17. 755-760. Keller, T., & Olson, W. (2000). The advisabilky of outdoor leadership training: Caveat emptor- Review of Business. 2J(I). 4-6. Klaw. S- (1961, August). Two weeks in a T-group. Fortune. 64, 114-117, 150-158. Kleiner, A- (1996). The age of heretics.- Heroes, outlaws, and she forerunners of corporate change. New York; Doubieday. Laabs. S. J. (1991, June). Team training goes outdoors. Personnel Journal, 70, 56-63. Lee, J. A. (1980). The gold and the garbage in Ohio University Press. Lee, L. K. (2001. June). Sensitivity training at the University of California, Los Angeles, 1952-1971. Paper presented at the 33rd Annual Meeting of the International Society for the History of Behavioral and Social Sciences, Bloomington, IN. London. M. (1995). Self and interpersonal insight: How people gain understanding of themselves and others in organizations. New York: Oxford University Press. Mann, E. K- (1970, March). Sensitivity training: Should we use it? Training and Development Journal, 24, 44-48. Marrow, A. J. (1964). Behind the executive mask. New York: American Management Association. Marrow, A. J. (1967). Events leading to the establishment of the National Training Laboratories. Journal of Applied Behavioral Science, 3, 144-150. McGregor, D. (1960). The human side of enterprise. New York: McGraw-HiIl. Moreno. J. L- (1953). How Kurt Lewin's "Research Center for Group Dynamics" started. Sociometry. 16, 101-104. Newcomb,T.(1943). Personality and social change. New York: Dryden. Odiorne. G. S. (1962, spring). Managerial narcissismThe great self-development binge. Management a/Personnel Quarterly. I, 20-25. Office of Strategic Services Assessment Staff (1948). Assessment of men: Selection of personnel for she Office of Strategic Services. New York: Rinehart. Peters, J. J. (1973). Do encounter groups hurt people? Psychotherapy: Theory, Research, and Practice. 10, 33-35. Poppy, J. (1968, July). It's OK to cry in the office. Look, 9, 64-76. Rettig, J. L., & Amano, M. M- (1976. January). A survey of ASPA experience with management-by objectives, sensitivity training, and transactional analysis. Personnel Journal, 55, 26-29. Rogers, C. R, (1970). On encounter groups. New York; Harper & Row. Sackett. P. R- (1994, April). The consent and process of the research enterprise within industrial and organisational psychology. Presidential Address to the annual meeting of the Society for Industrial and Organizational Psychology, Nashville, TN. Schein. E. H., & Bennis, W. G. (1965). Personal and organisational change through group methods: The laboratory approach. New York: Wiley. Sherif, M, (1936). The psychology of social norms. New York: Harper, Tannenbaum. R. (1996). Bob Tannenbaum: An unfolding life. Bethel, ME: National Training Laboratories (1961). : Leadership and organization: A behavioral science approach. New York: McGraw-Hill. What makes a small group tick? (1955, August 13). Business Week. Whyte, W, H. (1956). Tile organization man. New York: Simon and Schuster. Wohlking. W. (1971, December). Management training: Where has it gone wrong? Training and Development Journal, 25, 2-8.